Our Fiordland adventure started in Te Anau where we arrived safely after a rather hair raising journey via the Crown Range Road. We had been told that this route was unsuitable for camper vans but our Sat Nav took us onto it without us realising until it was too late. Finally, after what felt like an age of twisting and turning hairpin bends plus steep climbs and descents, Sue was finally able to release her death like grip from the door handle !! 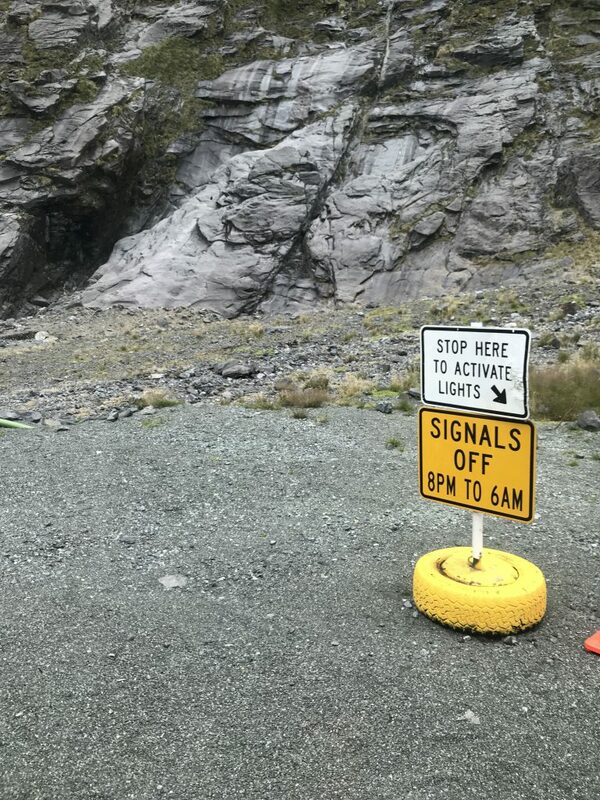 That evening after a leisurely dinner in the camper van we visited the Te Anau glow worm caves. These had been highly recommended but left us slightly underwhelmed – and bitten. The next morning however the real fun started with our journey to Doubtful Sound where we would spend the night on the Doubtful Explorer. 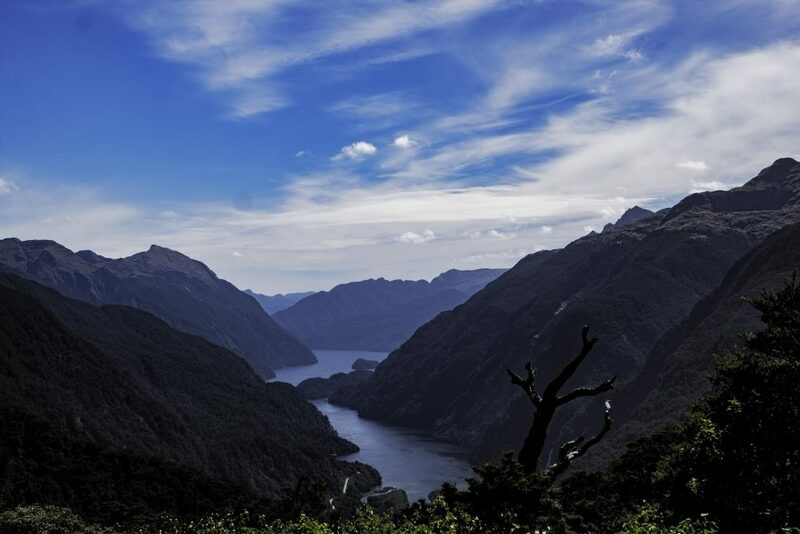 Doubtful Sound is the most remote part of New Zealand and as we crossed Lake Manapouri and drove into the fiords we were rewarded with out first glimpse of it. 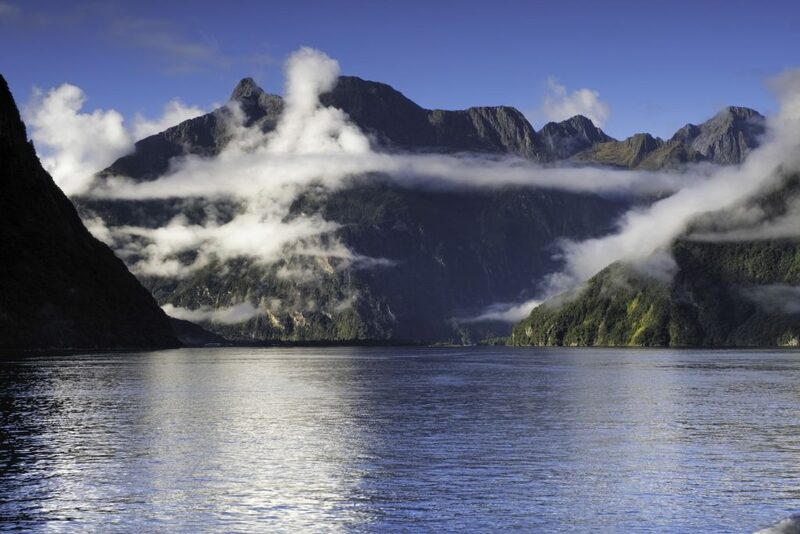 Once aboard we cruised along through the Fiords taking in the amazing scenery. Our cabin, after more than a week in a camper van, seemed huge !! As we headed down the Sound towards the Tasman Sea we saw seals sunbathing on the rocks, and once back in the Sound we boarded a tender for a closer look at the shoreline. The Guide explained the ecology and geology of the area whilst we cruised around, being munched by sand flies – apart from Sue who was in full ninja mode. That evening we enjoyed a buffet dinner with our fellow passengers. We had so much fun we missed the conservation presentation ! The next morning, well rested but a little hung-over, we cruised back to the dock under a wonderful mackerel sky, seeing bottlenose dolphins and the rare Tawaki Fiordland penguin. 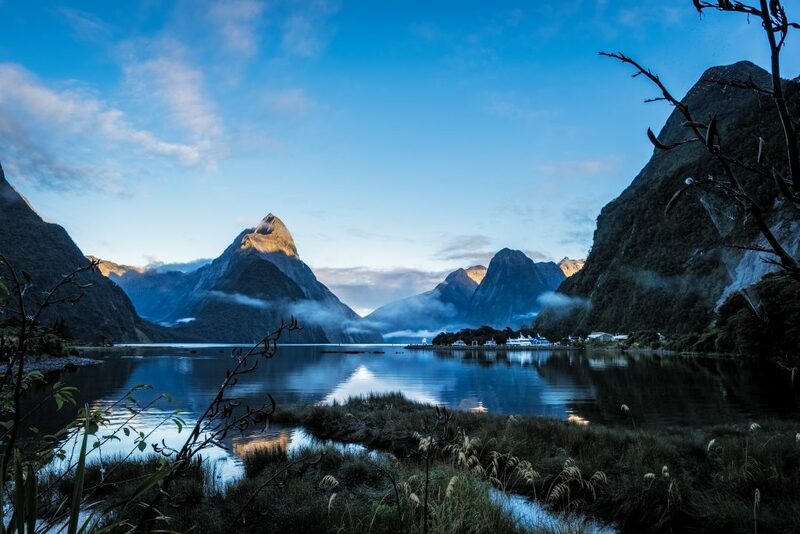 Once we got of the ship, we collected our camper van and started the drive to Milford Sound, the second of our Fiordland destinations. This involved a journey through the Homer Tunnel. which was like a descent to the centre of the earth – but we made it 🙂 The tunnel was started in 1935 and completed in 1953. As it was tunnelled by hand using picks and wheelbarrows they only got round to creating one lane ! Don’t jump the lights ! 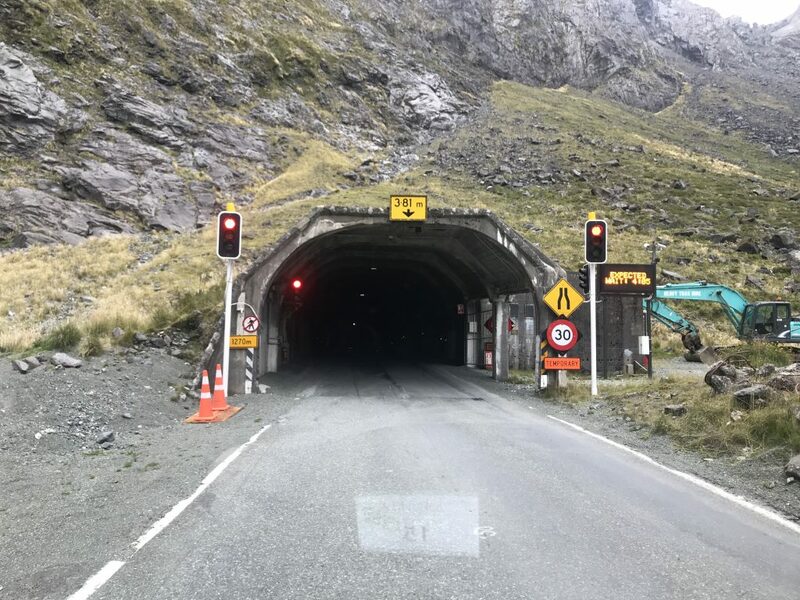 The Homer Tunnel – one lane only ! Whilst the weather on Doubtful had been amazing, that night it poured it down and the rain bounced of the roof of the camper van all night. 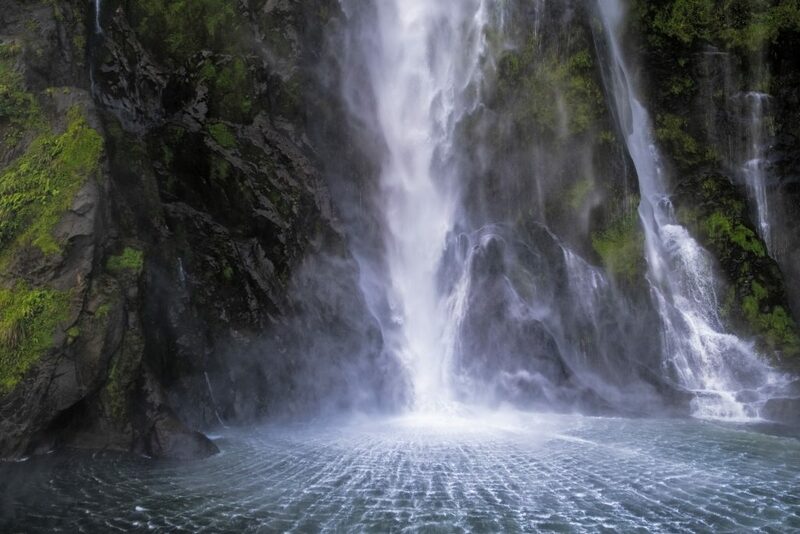 This is not surprising as Doubtful and Milford Sound gets more rain than the Amazon Rainforest. 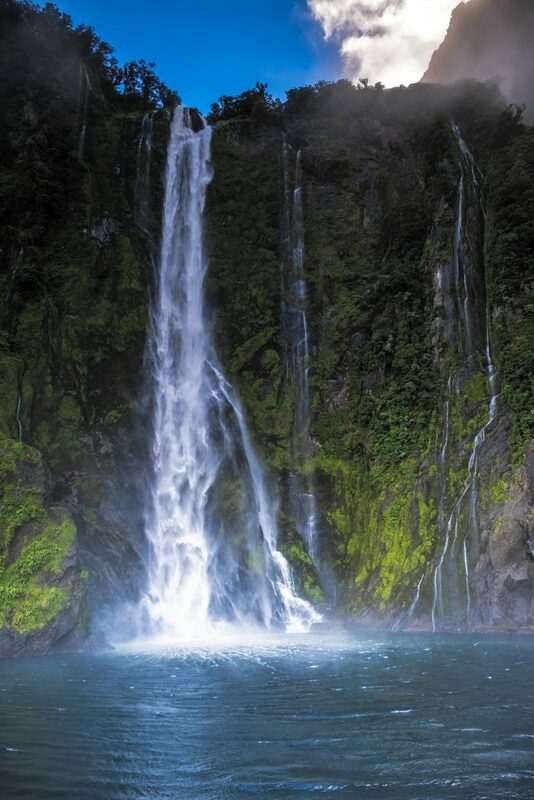 Whilst the Amazon experiences about 2m of rain a year, Fiordland has over 7m !! However, the following morning we woke to a glorious sunrise. 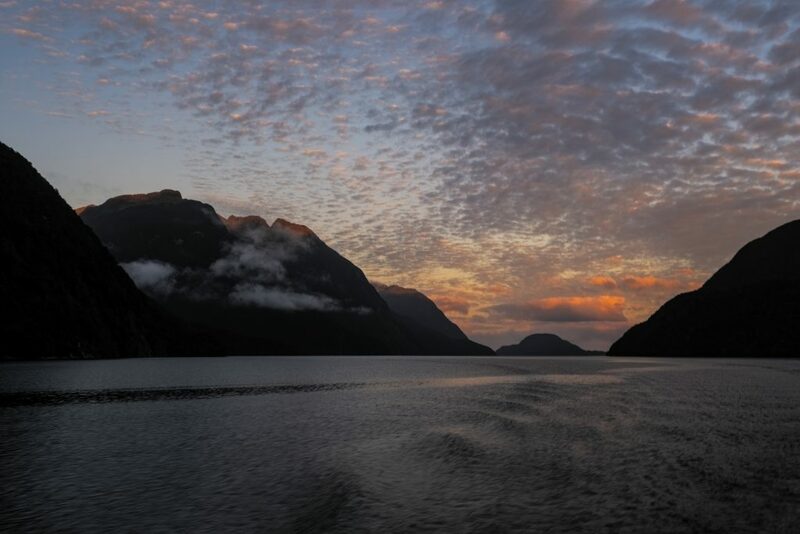 The fine weather prevailed all day, allowing us to enjoy a short scenic cruise around amazing Milford Sound. We saw some of the worlds highest waterfalls, including Sterling Falls which at 151m is three times the height of Niagara Falls. We even got up close and personal with them. Once back on shore we headed off for another hike – this time to Lake Marian. 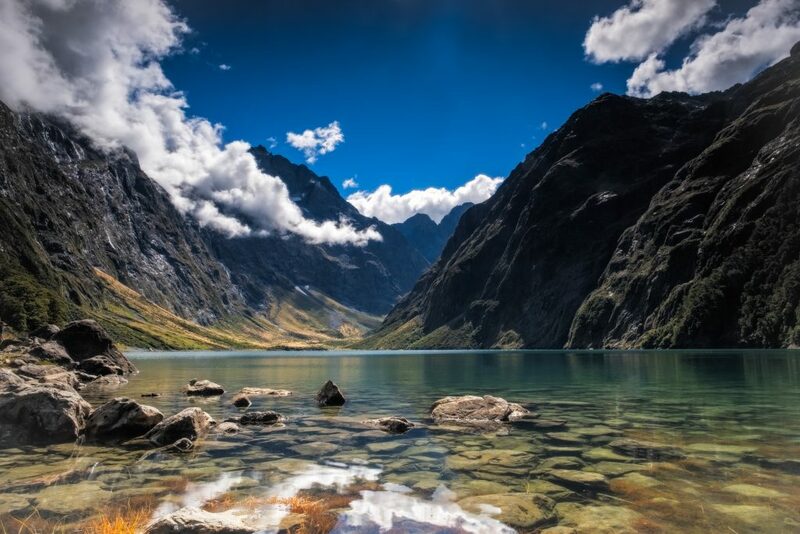 Lake Marian is an alpine lake in a hanging valley formed by glacial action, in one of the most beautiful settings in Fiordland. The lake is above the bush line and is surrounded by mountains. The climb up through the rainforest was tough; very steep in parts and very humid from the rain the night before. But we pushed on and were finally rewarded with a stunning view of the lake. 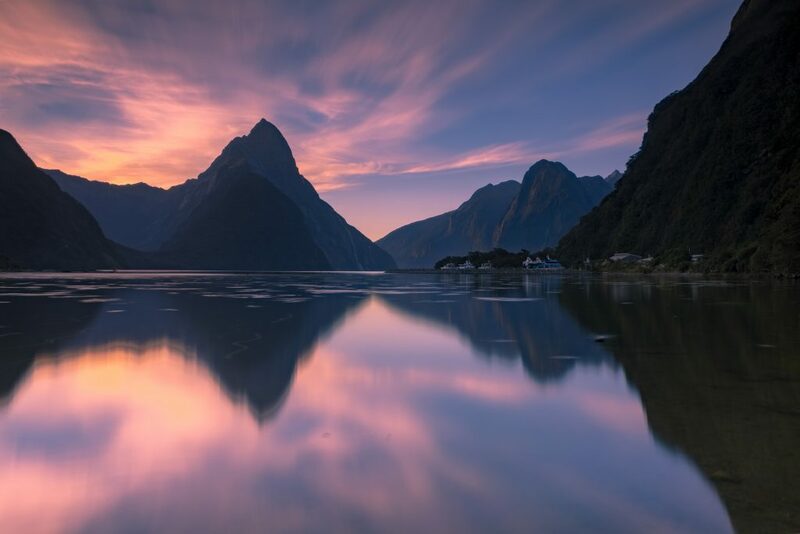 That evening Odie went back to the edge of Milford Sound to take another picture. Apart from the sand flies attacking him, he was all alone in this magical place. Those photographs are so amazing, what stunning scenery! 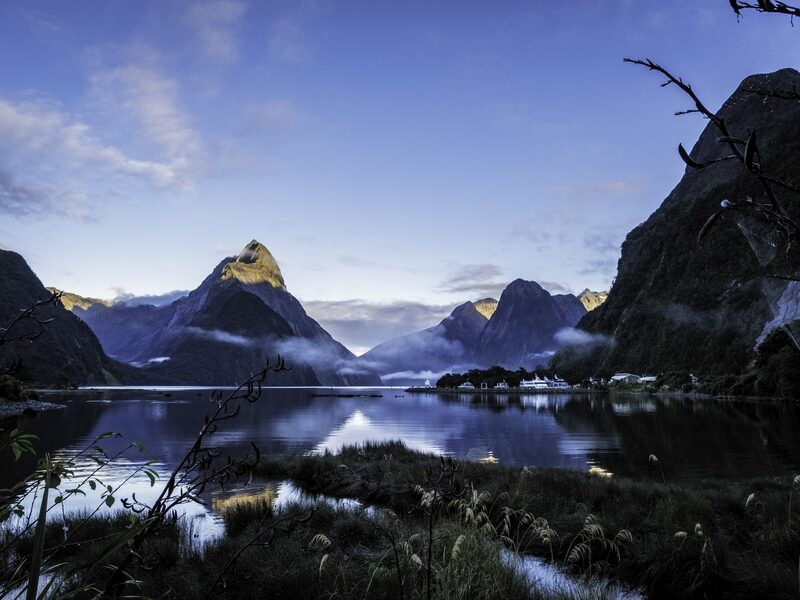 You have captured the beauty of Fiordland perfectly. Not sure where you are heading next but wherever it is drive carefully and use plenty insect repellent! One runs out of adjectives and superlatives to describe the beauty of the area. 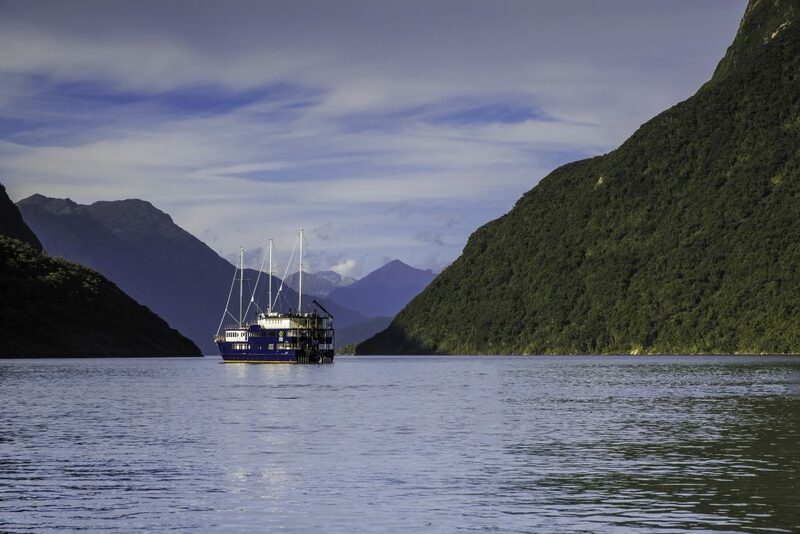 No doubt the rest of your NZ Adventure will find the Fiordland experience hard to beat ! !